Right now, as you read this, are you indoors? Perhaps in your office or at home? And are you using a mobile device to access the blog? If you are, you are part of the statistic that says around 80% of all mobile broadband is used inside buildings. Walls, windows and interference from other users can degrade a cell signal. But Massive MIMO with Carrier Aggregation is an ideal solution for addressing these challenges and improving indoor service. It’s an exciting technology that we, together with Sprint, demonstrated at this year’s MWC Americas in San Francisco in September. The technology is superb for mitigating interference and providing vastly increased capacity and throughput speeds. The demo showcased the performance that is feasible with commercially available devices using Sprint’s 2.5 GHz spectrum. It was based on Nokia AirScale Massive MIMO Active Antenna System 64 transmit and 64 receive antennas, together with an AirScale Base Station with Massive MIMO and Carrier Aggregation software. Massive MIMO with Carrier Aggregation is a building block of high speed, high capacity 5G networks. As the first operator to demonstrate it on 2.5GHz, the technology is a competitive advantage for Sprint because it is more easily deployed on TDD-LTE 2.5 GHz. It’s also an important innovation that takes advantage of Sprint’s deep 2.5 GHz spectrum holdings. 100 MB of 4K video downloads in 0.19 seconds! 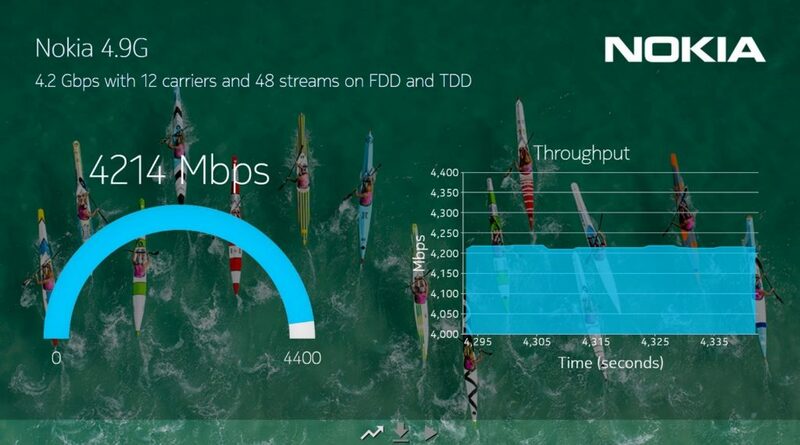 Nokia also demonstrated blistering fast 4.2Gbps throughput demonstration using Nokia AirScale Base station, which is the highest throughput record over LTE. For those of you keen on the details, we used eight FDD carriers of 20 MHz each and four TDD carriers of 20 MHz each, breaking our previous record of 10 carriers. On each of them we ran 4X4 MIMO – which typically doubles the usual LTE MIMO throughput. And we ran 256QAM on all the carriers. The result was 100 MB of 4K video clip in 0.19seconds. So, if you want to ensure that your networks will enable future handsets to benefit from this remarkable increase in speed and capacity, I encourage you to follow Sprint’s forward thinking example. To learn more about AirScale, download our eBook. Stay tuned for more world firsts as we continue to blaze a trail to 5G.